Stolen Niagara Ice Dogs Equipment | Professional Use Only, No Warranty. The Niagara Regional Police Services recently released a break and enter for an incident that occurred back in April of this year. Some of the items stolen include Mark Visetin’s 37+1 Vaughn Pads, a couple player’s helmets, gloves, sticks and other protective gear. Since the beginning of April, 2012, the Niagara Regional Police have been investigating a Break & Enter at the Gatorade Garden City Complex, located at 8 Gale Crescent, in the city of St Catharines. During the Break & Enter, several hockey items belonging to the Niagara Ice Dogs were stolen, including Mark Visentin's unique Vaughan 37 + goalie pads, valued at $3000. Visentin represented Canada during the 2011 and 2012 Word Junior Hockey Championships. 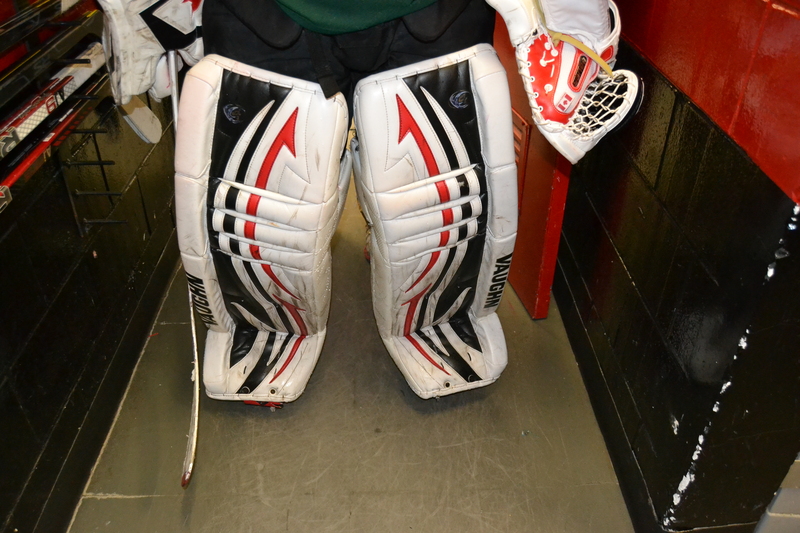 The goalie pads are white with red and black trim, and have "Visentin" stitched on either side. CCM - 2 white helmets with #13 and #10 stickers on the back. Size small. 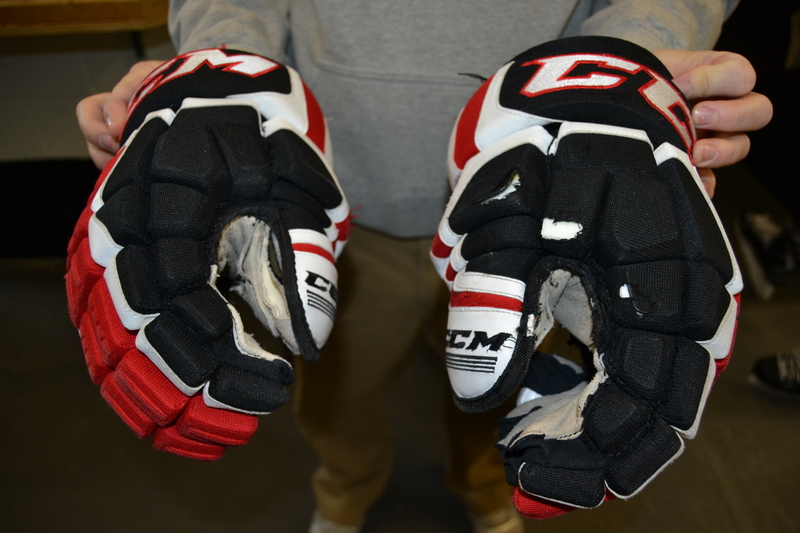 CCM - black red and white hockey gloves. #9 written on cuff. Reebok - black and white, size medium elbow pads. Model 11K. Reebok - black and red, AI9 hockey stick with "Mercer" stamped on the upper shaft. www.niagaratips.com Text: 274637 (CRIMES), keyword 'Niagara', then your tip. Crime Stoppers guarantees that you will remain anonymous through any of the methods offered to provide tips. You may also be eligible to receive a cash reward of up to $2,000 if the information leads to an arrest. The pads will be unique enough to spot should they come onto the market. This entry was posted on August 22, 2012 at 6:29 am and is filed under ProStockNation.com Announcements with tags CCM Gloves, Mark Visetin, Niagara Ice Dogs, RBK 11K, Vaughn Pads. You can follow any responses to this entry through the RSS 2.0 feed. You can leave a response, or trackback from your own site.